I saw Sandburg's Lincoln (originally just called Lincoln) when it first came out in the 70's and it burned itself into my brain because it was just such a well done Lincoln biography. Since then however I've only seen it repeated once, and I always hoped it would come out on DVD so I could buy it. It certainly took long enough but is well worth the wait. Hal Holbrook gives a masterful performance as Lincoln, with all the riveting countrified genius history says he had. This Lincoln is as utterly convincing stretched out whittling and telling stories, as he is delivering his 2nd inaugural or debating Stephen Douglas. He totally inhabits the part, a job made easier I'd think by the wonderful actors he's surrounded with. In particular, Sada Thompson is quite his equal as Mary Lincoln. Their portrayal of the relationship that existed between Mr. & Mrs. Lincoln is the best I know of. Sure Mary is a difficult woman, and Thompson covers the tantrums and squabbles, but these are one of the most loving Lincoln couples ever shown. You see how Lincoln gave strength to Mary through her troubles, but you also see how she gave strength (and good advice) to the President. What comes out is a 3-dimensional couple, not just the cardboard cutouts of Mary as a witch and Lincoln as the patient saint. Another great actor in this is Beulah Bondi. She only appears in the first episode playing Lincoln's step mother Sara Bush Lincoln, but her scenes with Holbrook frankly just break your heart. I tear up whenever I see it. Sandburg's Lincoln was one of Bondi's final roles (she just did 2 episodes of The Waltons after this) and it is a fitting crown to her career. A few drawbacks: Some people are put off by the fact that Holbrook was heavily made up to more closely resemble Lincoln. Some other actors (like Sam Waterson in Gore Vidal's Lincoln) prefer to play the part with virtually no make up. But Holbrook's make up is very well done and as I say he completely inhabits his role. I find that after a few minutes I entirely forget that this is Hal Holbrook in make up and after that adjustment Lincoln's face looks absolutely authentic to me. Some viewers also feel that this presentation of Lincoln is episodic. And they're right, because Sandburg's Lincoln was originally presented sporadically from 1974 to 1976. Each episode covers a particular theme in Lincoln's life and they were not presented in chronological order. This resulted in some unavoidable anomalies: for instance, 2 different men (Lloyd Nolan in 1975, Whit Bissell in '76) played Secretary of State Seward. And you see 2 episodes with Lincoln in the White House before you get to see him as a young prairie lawyer. This set has rearranged the episodes into a more chronological order. 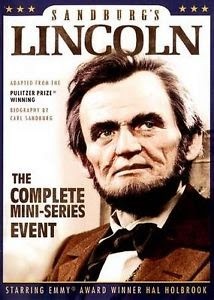 One other point: As the title suggests, this miniseries was based on Carl Sandburg's biography of Lincoln, which is no doubt the best written biography -- but not necessarily the most accurate. 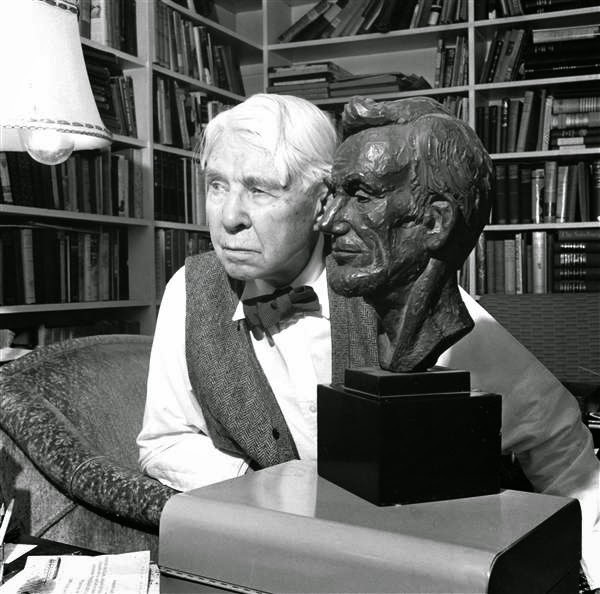 Mr. Sandburg included several "facts" and events in his 6 volumes that are great for dramatic purposes, but a Lincoln scholar will tell you didn't really happen. One of them has a major effect on one of the episodes in Sandburg's Lincoln. In the 'Mrs. Lincoln's Husband' episode, Mary is accused of having confederate-leaning sympathies and perhaps even of being a traitor. Lincoln's political enemies conspire to use this accusation against him. And Mary Lincoln's loyalty was actually questioned during the war, making difficulties for her husband. In Sandburg's biography and in the miniseries, Lincoln eventually defuses the whole thing by appearing unannounced to vouch for his wife before a congressional hearing called to examine the question, something that Presidents never, ever do (separation of powers and all that). It's a very dramatic story that sounds Lincoln-ish and has been popular for a long time. But, regrettably, it never really happened. Despite these slight reservations though, this miniseries is well worth being added to any Lincoln fan's collection. The performances are wonderful, it shows things usually skipped over by Lincoln films, and gives you a good feel for what it was like to be with Lincoln. Personally, I believe this is one of the best -- if not *the* best -- depictions of him in film.